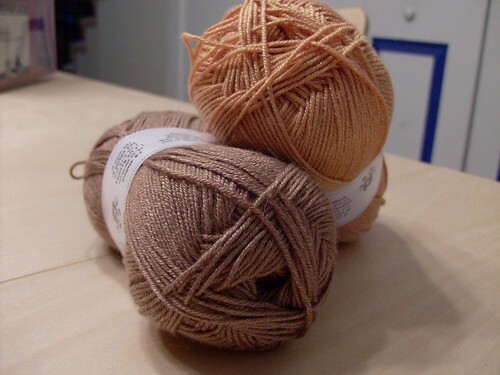 Crystal Palace Panda Silk (52% bamboo, 43% merino, and 5% silk) in colors 3002 (an antiquey gold) and 3021 (a light cocoa). The plan is for these to become Endpaper Mitts. 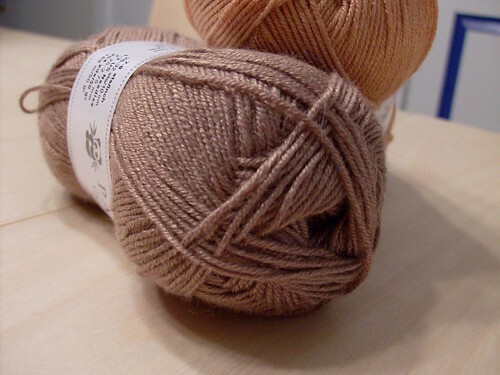 I love the ever so slight sparkle to the yarn from the silk. I think it’s going to be gorgeous. Pandas are bears, just of a genus by themselves – Ailuropoda, coz they ain’t like any other bear. I don’t think anyone would disagree. Theyz cute. Although the yarn name makes me think of the silk being squeezed out of Pandabutt instead 😉 It still looks tres good though! I’m glad you meant silkworm bugs. Way better. Wow. So shiny! I’m curious about the texture — I don’t think I’ve ever felt bamboo fiber. What a versatile plant. Oooo, I didn’t know CP made Panda Silk! It’s beautiful! Love that sheen. I won’t go look it up. I won’t. I won’t. I won’t. I have some of that in variegated purple. It’s just so pretty!! That IS pretty. 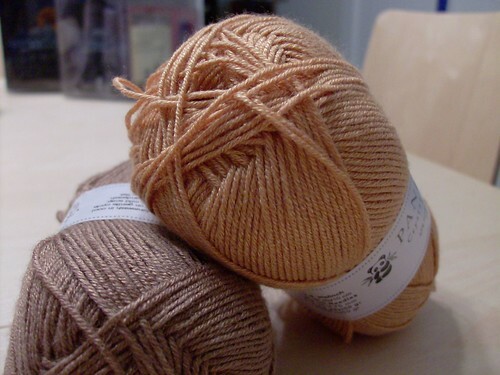 Will make pretty mitts. I thought pandas were related to raccoons, not bears. Am I on crack? I love the sheen on the Panda Silk, though. A lot. And it looks very soft. I think I may have to own some eventually. I just saw your picture over on Turtlegirl’s website…I recognized the jacket you work to MDS&W. That was so cool!